Note: Must buy in pairs for your normally talking use. Widely used in supermarkets, hotels, factories, construction sites, residential property, beauty salons, entertainment clubs, factory warehouse, etc. *Clearer Talking: With INC noise reduction technology and 1000-6000M long working range, stable performance. 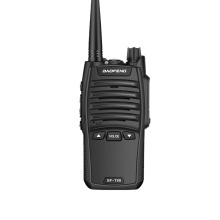 *16 Channel Capacity: 400-470MHz long communication Frequency range. Write frequency encryption. *3800mAh High Capacity: Battery save, long standby time. With low voltage alert and overcharge intelligent protection. *Multi-functions: Voice prompt, launch overtime warning. Built-in LED flashlight, and it can be used in the evening. *Mini Size, Ergonomic Design: Easy to hand-hold and operate. With earphone.